Sangita Kalanidhi 2018 to Aruna Sairam - IAS - Daily Current Affairs, IAS Syllabus Exam Strategy, IAS Preparation. Madras Music Academy has selected Carnatic vocalist Aruna Sairam for prestigious Sangita Kalanidhi Award of 2018. She is Vice-Chair of Sangeet Natak Academy. She has various awards and recognition in her name including the Padma Shri and US Congress Proclamation of Excellence. She is Music Ambassador of India, for successfully taking Indian music to the global arena. The title awarded yearly to Carnatic musicians by Madras Music Academy. The first title was awarded to T. V. Subba Rao and M. S. Ramaswamy Iyer in 1929. 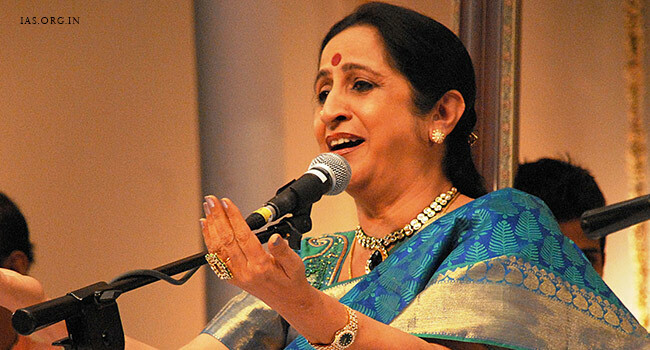 Born in Mumbai, 65 years old, Aruna Sairam born into a family with a deep love of music. In her early age, she met her Guru Sangita Kalanidhi Smt. T. Brinda, who trained her in the style of her own mentor, Veena Dhanammal (torchbearer of the school of Carnatic music). Aruna has performed at various prestigious venues and international events in the US, UK, France, Germany, Switzerland, Canada, Morocco, Malaysia, Netherlands, Singapore etc. International critics have compared Aruna's music to that of legendary Jazz saxophonist and composer, John Coltrane.